The evolution of wings not only allowed ancient insects to become the first creatures on Earth to take to the skies, but also propelled their rise to become one of nature's great success stories, according to a new study. The oldest confirmed insect fossil is that of a wingless, silverfish-like creature that lived about 385 million years ago. It's not until about 60 million years later, during a period of the Earth's history known as the Pennsylvanian, that insect fossils become abundant. "There's been quite a bit of mystery around how insects first arose, because for many millions of years you had nothing, and then just all of a sudden an explosion of insects," said study first author Sandra Schachat, a graduate student at Stanford's School of Earth, Energy & Environmental Sciences (Stanford Earth). 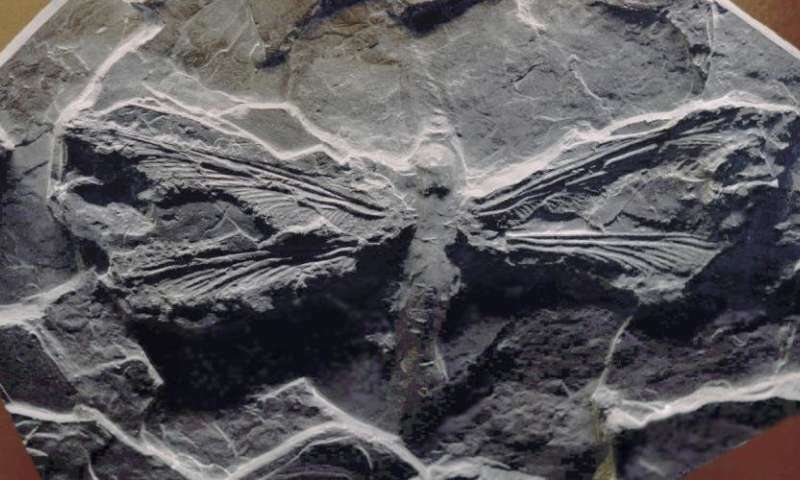 According to one popular hypothesis, insect size and abundance were limited by the amount of oxygen available in Earth's atmosphere during the late Devonian period. Another possibility is that insects were abundant before 323 million years ago, but don't show up in the fossil record because the kinds of terrestrial sediments capable of preserving them didn't survive. In the new study, published this week in the journal Royal Society Proceedings B, Schachat and her colleagues tested both of these arguments - that low oxygen limited insects or that the rocks weren't right to preserve fossils. First, the team updated Berner's nearly decade-old model using updated carbon records. When they did this, the dip in atmospheric oxygen during the late Devonian disappears. "What this study shows is that environmental inhibition by low oxygen can be ruled out because it is not compatible with the most current data," said study coauthor and Stanford Earth paleontologist Jonathan Payne. To test the "bad rocks" hypothesis, the team analyzed a public database of North American rock types for different periods in the Earth's history and found nothing unusual about the sediments of the late Devonian. "The rocks could have contained insect fossils. The fact that they don't indicates the dearth of insects during this period is real and not just an artifact of bad luck with preservation," said Schachat, who is also a fellow at the Smithsonian Institution in Washington, DC. "The fossil record looks just how you would expect if insects were rare until they evolved wings, at which point they very rapidly increased in diversity and abundance," Payne said. Schachat said it's notable that the first two winged insects in the fossil record are a dragonfly-like insect and a grasshopper-like insect. These represent the two main groups of winged insects: dragonflies have "old wings," which they cannot fold down onto their abdomens, and grasshoppers have "new wings," which are foldable. "The first two winged insects in the fossil record are about as different from each other as you could possibly expect," Schachat said. "This suggests that, once winged insects originated, they diversified very, very quickly. So quickly that their diversification appears, from a geological perspective and the evidence available in the fossil record, to have been instantaneous." Being the first and only animals able to fly would have been extremely powerful. Flight allowed insects to explore new ecological niches and provided new means of escape. "All of a sudden, your abundance can increase because you can just get away from your predators so much more easily," Schachat said. "You can also eat the leaves that are at the top of a tree without having to walk up the entire tree." Flying insects could also create niches that didn't exist before. "Imagine an omnivorous insect that flies to the top of trees to feed," Schachat said. "Suddenly, there's a niche for a predator that can fly to the top of the tree to eat that insect. Wings allowed insects to expand the suite of niches that can be filled. It really was revolutionary." While the new study links the evolution of flight to the ascension of insects, it raises new questions about how and why they evolved wings in the first place, said study coauthor Kevin Boyce, an associate professor of geological sciences at Stanford Earth. "In the Devonian, there were only a few insects, all wingless," Boyce said. "But you come out the other side and we have flight. What happened in between? Good question."